Have you seen this book? It gave me the idea of having a couple different, plain bed coverlets which can be spruced up with bed runners and matching pillows/pillowcases. What do you think? It would be a wonderful way to keep bedroom decor fresh without spending a ton of money and time! 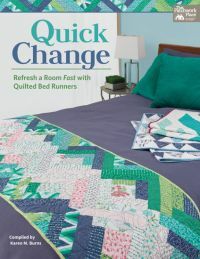 Quick Change, compiled by Karen Burns at Martingale, showcases beautiful designs by a host of accomplished quilters, including Kimberly Jolly from Fat Quarter Shop. The 13 patterns offer many color/block combinations for when you just want to start working right away on a project. Alternatively, they provide enough inspiration and opportunity for you to customize a design to your own liking. The book has an eVersion, too, which is great for those of us who are running out of bookshelf room. If you are looking for a quick, fun project or need a gift which will make a big impression without a huge investment of time and money, this may be the book for you.